We're pleased to share with you our latest update to the site, which is aimed at giving you more control when printing and downloading routes. Firstly, we've added an option to include only those route directions that have symbols or labels (typically Points of Interest - POI's), when printing or downloading a route. Previously, when you downloaded a route to a GPX file, we automatically added a Waypoint for every direction, but as well as this option you can now choose to only add Waypoints for directions that have labels or symbols, or to not include any Waypoints at all. The same options are also now available when printing route directions. Secondly, we've introduced a new option to print the directions for a route without having to print the map as well. You can still print off both if you wish, but if you only want the directions, this option is now available to you. 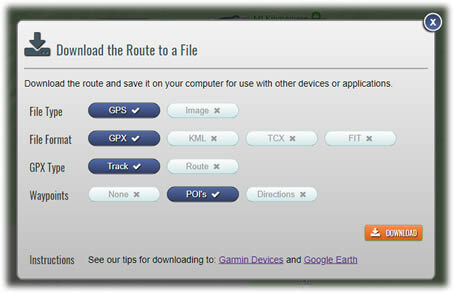 To make this easy, we've added a new Print Directions button above the list of directions on the Route Viewer. Hi, can I download routes to my iOS device with standard membership? When I try to download, I get an error message..? Thanks. Hi Dave - to print, select PRINT from the menu above the map when veiwing the route or from the menu panel in the bottom right of the map when editing a route in the route planner.